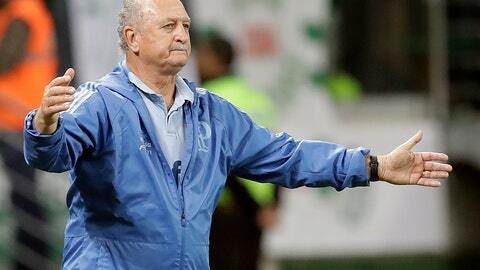 SAO PAULO (AP) — Four years ago, then-Gremio coach Luiz Felipe Scolari was humiliated by his once-loving Palmeiras fans during a Brazilian league match. They chanted “7-1! 7-1! 7-1!” during their 2-1 victory at Pacaembu Stadium, a reference to the hammering Big Phil took as Brazil coach in the 2014 World Cup semifinals against Germany five months earlier. It didn’t matter that Scolari had given the Sao Paulo club its only Copa Libertadores title in 1999. Or that he was the mastermind when Palmeiras won the 2012 Brazilian Cup unbeaten with one of their worst teams in recent history. The home humiliation with Brazil was too big of a stain to be erased so quickly. Few expected that when Scolari took over in July. Palmeiras was lagging in sixth place in the standings despite being the biggest spender in the country. Midfielder Lucas Lima, once courted by Barcelona, was not delivering. Former Alaves striker Deyverson was too undisciplined. The team’s defense was unreliable. But after a record 21-match unbeaten streak in the league, no one in Brazil doubts the former Chelsea manager anymore. Scolari’s team now has 74 points, five ahead of Flamengo, with two matches to play. “There is no use in breaking records if we are not crowned champions,” Scolari said Wednesday after a 4-0 win over America. After spending three years at Chinese club Guangzhou Evergrande, the 70-year-old Scolari is once again revered as one of the best Brazilian coaches in the business. His attacking Palmeiras team is much more stylish than the stiff Brazil of four years ago and, most importantly, the 7-1 chants from opposing fans have disappeared. Even if the title doesn’t come on Sunday, Palmeiras will still have another chance at home on Dec. 2 against Vitoria, which could be relegated by then. Chile midfielder Jean Beausejour used his national team jersey to make a point. The president of the Chilean soccer association, however, denied the request of a minute’s silence because Catrillanca did not have any sports links. So Beausejour wore his mapuche name of Coliqueo on his national team shirt. Chile won the match 4-1. Two weeks after Penarol defended its Uruguayan title, there are still players fulfilling their promises and taking pictures to prove it. Midfielder Cristian Rodriguez climbed the Pan de Azucar, one of the highest points in the country at 389 meters. Midfielder Fabian Estoyanoff dyed his hair silver. Rodriguez scored Penarol’s winning goal in the victory over archrival Nacional on Nov. 11. Penarol has 52 Uruguayan titles while Nacional has 46. America de Quito, the runner-up in the Ecuadorian league in 1969 and 1971, is back in the country’s top division for the first time in 30 years. Known as “Cebollitas,” or the Little Onions, they were relegated in 1988 and had not returned until Wednesday’s 4-0 win over Portoviejo. In the last round of Ecuador’s Serie B, America has a shot at winning the title.